Absolutely beautiful property in the most perfect location. The house is situated at the centre of its own 25000 sq mtr plot (over 6 acres) and is approached via its own gated entrance and sweeping driveway. This lovely property is just a minute from the village with its selection of bars, restaurants, shops, banks, schools, public areas and every amenity. 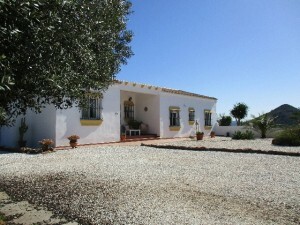 It is only 35 minutes to Malaga, the beaches and the airport. The property is fully fenced and has lovely gardens and flat land areas. The house comprises large spacious and bright sitting room with dining area, fully fitted and equipped kitchen, master bedroom with fitted wardrobes and ensuite shower room, galleried access to two further double bedrooms and the family bathroom. The sitting room has nice high ceilings, a log burning stove with convector, ceiling fans and a spacious dining area. The kitchen is fully equipped and has lovely granite work surfaces. The views from every aspect of this property, both internal and external, are simply stunning. Outside there are various terrace areas with outside dining facilities and a lovely covered Pergola area with BBQ. The 7 x 4 metre pool is surrounded by leisure terraces. There are mature garden areas with flowers, shrubs and numerous fruit trees. There is a carport and 2 storage sheds and ample parking for numerous visitors. There is mains electricitry and water and an underground reserve water deposit. There is also broadband internet and satelite TV. At the lower level of the property where the entrance gate is there is a large flat area that could easily be used for the keeping of horses or other animals. This property has absolutely everything and with its close proximity to the village it is an ideal permanent residence or a lovely holiday retreat.